What Cruiser Would You Buy? I do enjoy taking the group to a fine restaurant several times each summer. Do ALL those cruises NOW. Time waits for no one. What time is the party and where. Aren't we all invited? I was checking with some people in Buffalo & Rochester. Lake edge buildings are pounded very badly. Like in a earthquake zone with deadly buildings ready to let go any time. Is 1 crack sound fatal or 3 ? Neighbors are clearing snow off of roofs as fast as they can. Hopefully they have made snow rakes up. But the person can still get buried. Rip is right about people trading down in size. Been going on since the Crash. The first 2 were comparisons for Hatem and the Azimut Yacht he mentioned since they are similar pricing. And I thank you very much for that, Captain! 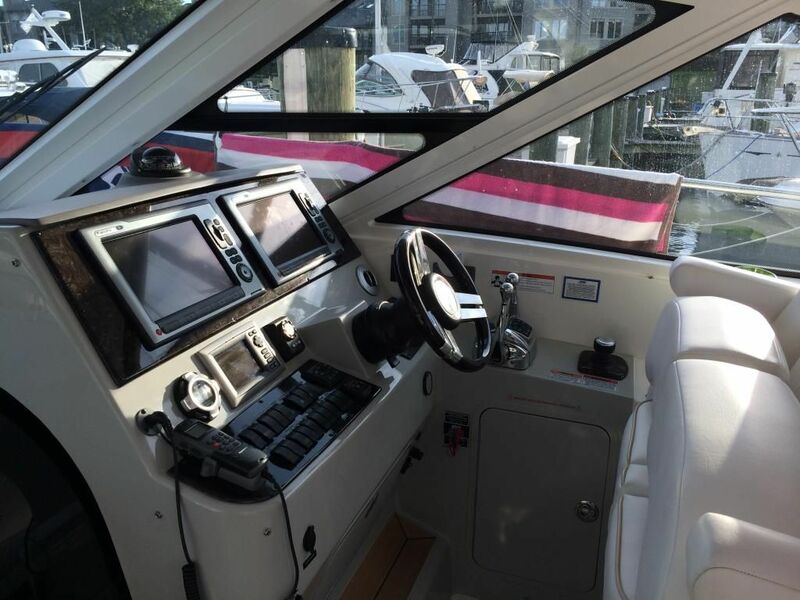 That 1999 Viking Princess 56 has a phenomenal interior. $250K in upgrades since 2011 and asking price is $299K? Taking a major hit with that but I see why. BTW, I notice many fellas love those Formulas and I don't know what it is, but they don't appeal to me whatsoever! As a matter of fact, I find them quite ugly! The only one in that brand that has any appeal to me is the CBR with the radar arch but then I would chose a Chap 327 over it any day of the week and most certainly the Premier. Even if it's true length is 38-40 without the swim platform, it's still a spectacular boat. As far as the 40' - 45' and of course on up, so much more appealing designs with other brands than the Formulas. Just MO. If both your boat and the 400 Chap were equal length (bigger or smaller), I'd take your Sea Ray hands down! Something doesn't look right with that Chap 400? It doesn't look in proportion? When I complimented you on your swept back look of the windshield and hardtop of yours, I think that's where the 400 Chap looks to be out of place and maybe it's the hardtop and windows that look too tall? That 400 is probably running gas anyway...yikes! Matt, I believe the reason it's like that is it gives you the best view out of the cockpit than most other boats in that class. Even Jim acknowledged that on another thread when he looked at it and was considering between the 400/420 and the 470 SR. While the SR had a better cabin layout, the Chap had a better view through those tall windshields. BTW, this and most of the Meridians appear to cut through these 3ft waves without any effort. 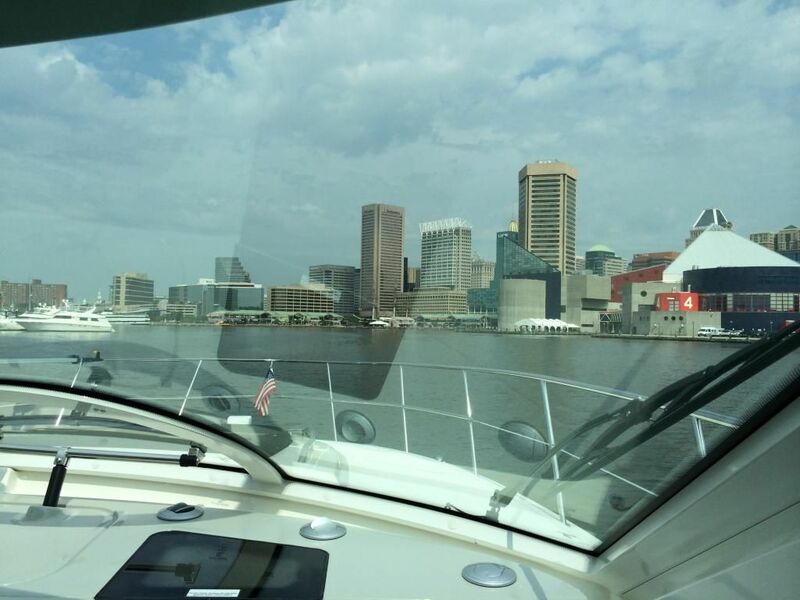 Even the Azimut 48 Flybridge is moving through that semi chop with relative ease. I'm very surprised at how stern heavy these things are and does anyone know why this thing is rooster tailing? It does look kinda weird, but from the inside at the helm the Chap gives much better visibility and less glare. Behind the glass in my boat, I have to wear polarized glasses to keep the glare down. Plus my sweep is so great that I have a lot of wasted space in my dash area. The frames in my windshield are also very thick versus the Chap. I'm not complaining, just saying it's a drawback and design flaw. SR should have used a darker color on the dash. I plan to install some canvas next year to dampen it down.Pros and cons to every boat. BTW, that Premier is almost certainly diesel. Here's a few photos of my view without polarized sunglasses. Look at the size of these frames I'm dealing with. The Chap's frames are much thinner. Tiara 44 and he Tiara 50 are both less that 1 year since introduction. The 44 starts without appropriate options at 920,000 deer, the 50 at about 1,300,000 deer. about as well as anything ever built. no where near the targeted price for many, many years. Sorry, when speaking of Tiara's under 400K I meant the Tiara 4300 Sovran, not 4400. The 2008,7 & 6 years are all under 400K. Very solid boats but we didn't like the salon area (not as open and airy as others in its class). I agree with you on Formulas, a lot of people like them because of the performance but in my opinion their design is getting outdated and old looking. I've noticed the one good thing about them (besides performance) is their ability to cut through waves and chops instead of climbing them and slamming down as that beats the heck out of you. Not sure if that's a product of their weight (since we're told they are very heavy boats but then how do they achieve that renowned performance with heavy boats if they basically use the same VP and Merc engines that others use) or, is it in the design of that keel and bow and weight distribution that is so effective? Definitely something good to find out so to consider upon next purchase. It does look kinda weird, but from the inside at the helm the Chap gives much better visibility and less glare. 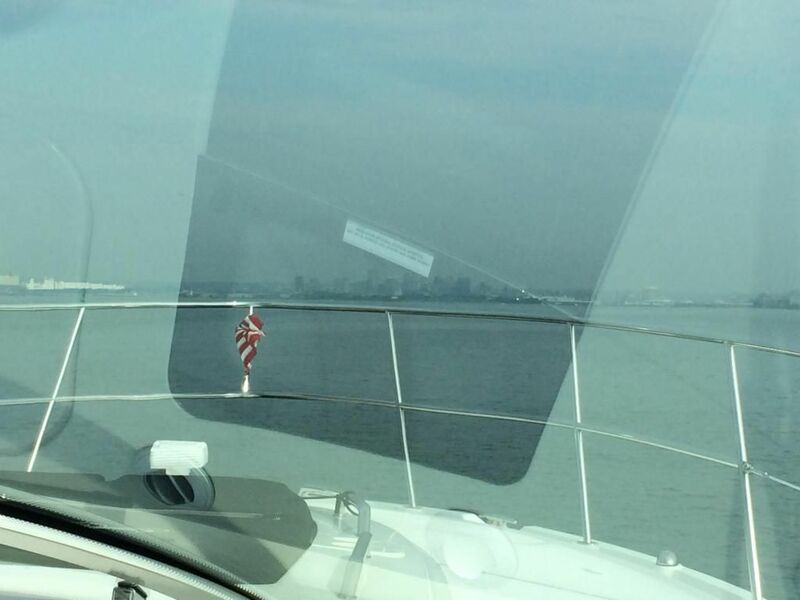 Behind the glass in my boat, I have to wear polarized glasses to keep the glare down. SR should have used a darker color on the dash. I plan to install some canvas next year to dampen it down.Pros and cons to every boat. BTW, that Premier is almost certainly diesel. Here's a few photos of my view without polarized sunglasses. I have the same exact problem in the 276 with the glare. There's so much fiberglass platform on the dash that the white just allows the glare to reek havoc. You'll have to show us what you do with that canvas you're talking about, Jim. It'll probably be something along the same lines as what Chap and some other builders are doing with the new designs, adding some type of dark, vinyl cover to reduce that glare. More pics, Jim, mooore, mooooooore! How about some of the cabin layout? EDIT: Also, do you have laundry on your boat? We left Chap as well and havent regretted our new purchase. Monterey 400 SY , and a newer used one can be had for under 400K. 400SY (Now 415SY) would also be my choice. Fantastic boat all the way around. Very cool. Thanks for the contribution. A few weeks back I came across the thread you opened when you first bought it and left a post asking how you liked the IPS system on that boat. It's probably one of the very few models in the 40' range that doesn't have a full, continuous, glass windshield that connects to the hardtop. It makes it a lot sportier and keeps that "under 40ft" feeling in a bigger boat. It's also one of the very few boats that offers the option for a TV mounted in the cockpit using one of those table-mounting plates that attach to the inside of the arch. Found that out when I was researching TV's for the cockpit area. IPS is the only way to go!!! Handles like a 20ftr! I avg 1.4 MPG this season and we tested the power with 12 adults on board full water tanks 300 gallons of fuel, loaded up as much as it would ever be. i went in 2-3ft seas and from idle at 5.8 mph we timed it to 32mph which is the cruise on this boat in 13.1 secs!!!! it is FAST and those motors are solid. We are burning 25-26 GPH combined at the cruise of 31-32 mph. Diesel is much cheaper on Lake Erie than gas. 4.05 per gallon at its highest this past summer. I have had my 11 year old dock the boat ( with close supervision ) The boat is big but you are right the open feel is nice when the weather permits. however we usually run with the front strataglass on but open the vent window and sunroof and pull off the center window of the strataglass. Plenty of air and it keeps it protected from the occasional rain shower and or wave splash in rough water. Good stuff, thanks. It would be nice to really understand the difference between the different systems on some of these larger boats for instance, is there really and advantage vs a disadvantage between the VP IPS pods with forward facing props versus the rear facing Zeus Cummins. I'm not sure how much available comparison information is out there being that it's relatively new technology, but the fear of forward facing props doesn't seem to have materialized into anything well know so they must be ok and work fine. Not sure what the advantage is, but maybe better bite with the forward props? Maybe that's why you're getting such good numbers. I know some of the big builders are now installing 3 VP IPS pods and engines on some of their bigger boats but not for performance or efficiency, but because they can chose the smaller motors for each which take up less space in the engine compartment giving them more cabin space. I guess versatility is another plus. Volvo IPS drives have been around for 10 years now, they were introduced in the fall of 2004. On another note cruise ships use the same style of pod drives as Volvo's design, forward facing. These numbers are compared to what, the Cummins? 10 years is longer than I had thought. Compared with inboard shafts at cruising with planing hulls. It's more really about the drive system then the engine. The reason I mentioned the engines was because some of the new big boats are adding a 3rd pod in between the conventional 2 which gives them the flexibility of installing a smaller motor for all three to get the equal performance of the 2 larger engines (or even better), but the smaller motors translates into a shorter ones which in turn adds around a total of 3 feet +/- in length to the cabin spaces. Its a very smart idea. So Joey, you would never consider an Azimut? One reason they get more space is because there is less drive systems in the engine compartment. Large 60 foot vessels don't have stern drives, they are V drives, straight shaft or pod style systems. Pod systems take very little space since it's connected to the back engine and then goes straight down thru the hull. As far as Azimut I like the styling but cannot get over the amount of engineering flaws in the vessel. One example is the CDS (cockpit drainage system), how come they have the discharge hoses going up hill. That fundamentally will not work as we all know. Also the fit and finish for that price of a vessel should be a lot better. I am looking forward to towing the one on Lake Lanier once he gets all of his issues fixed. . I will let you know when that happens!